​In the first phase of my action research, I focused on how to develop understanding and core concepts that might lead to higher student achievement in mathematics. Even though students are officially in high school grades, many of my special needs students are performing below several grade levels, therefore I concentrated on 7th grade standards in mathematics. These are several differentiation techniques I included in the process of learning math content to support special needs students as the action research was taking place. The second phase of my action research, I set time aside to introduce technology to differentiate learning and instruction using an online learning tool called Google Classroom. Students were expected to use Google Classroom to complete assignments, and learn content knowledge. A digital citizenship lesson and technical knowledge were presented. Aside from mathematics, 21st century skills, and educational technology standards were also addressed in this research. ​These were the CCSS addressed in this action research project. The standards correspond to 7th grade math standards in the areas of ratios and proportional relationships and the number system. 3. Use proportional relationships to solve multi-step ratio and percent problems. 1. Apply and extend previous understandings of addition and subtraction to add and subtract rational numbers; represent addition and subtraction on a horizontal and vertical number line diagram. 3. Solve real-world problems and mathematical problems involving the four operations with rational numbers. 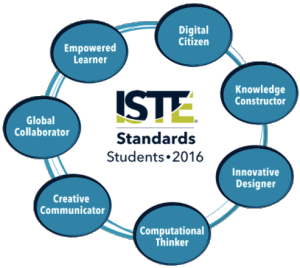 The ISTE standards addressed in this research project in conjunction with the CCSS, and 21st Century Skills, focused on developing students' understanding of what it means to be a digital citizen in and out of the classroom. The second standard revolved around how students could present projects, using different technology tools to deliver the content in a more engaging and innovative format.